Foliar symptoms, patterns of tree mortality, and the presence of fungal mats can be used as indicators of oak wilt. However, laboratory isolation of the fungus is recommended to confirm the diagnosis. A trained expert should be consulted. 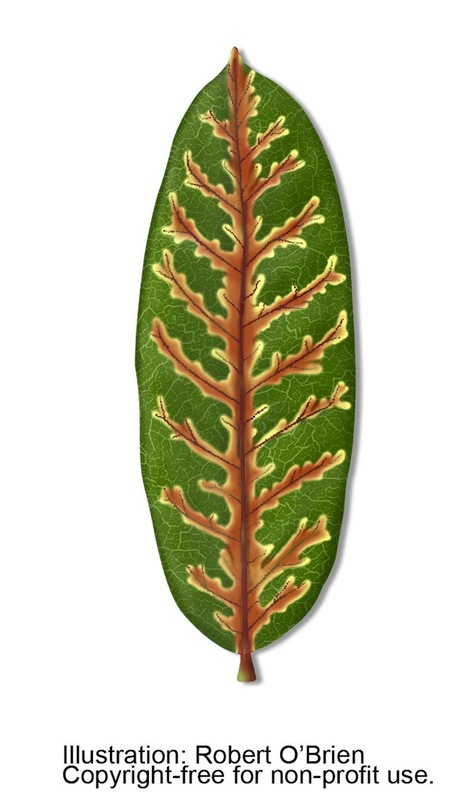 Most live oaks defoliate and die over a 1- to 6-month period following initial appearance of symptoms. Some live oaks take longer to die, and a few untreated trees may survive many years in various stages of decline. Occasionally, a few live oaks in an oak wilt center may escape infection and remain unaffected by the disease. 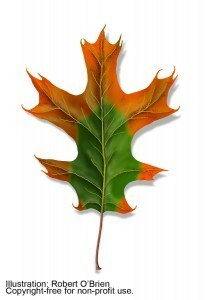 Red oaks never survive oak wilt and often die within 3 to 4 weeks following the initial appearance of symptoms. During summer months, diseased red oaks often can be spotted from a distance because of their bright autumn-like coloration in contrast to the surrounding greenery. Foliar symptoms of oak wilt on red oaks are less distinct. In early spring, young leaves simply wilt, turning pale green and brown, usually remaining attached for a period of time. Mature leaves develop dark green water soaking symptoms or turn pale green or bronze, starting at the leaf margins and progressing inward. This can begin on one branch and quickly engulf the entire tree. Red oaks generally die within 4-6 weeks. low soil moisture conditions. 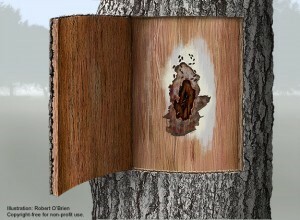 Fungal mats can be found by looking for inconspicuous narrow cracks in the bark of dying red oaks leading to hollow areas between the bark and wood. They often have a distinctive odor similar to fermenting fruit. Fungal mats can be exposed for inspection by chopping away the loose bark.